Today, we are not joined by Dr. Larry Arnn-- blessed are we to have relief from Doctor Arnn. We're joined by Professor Kevin Portteus. He is the professor of politics and Director of American Studies at Hillsdale. He has his PhD from the University of Dallas and his master's from the University of Dallas. But he is a proud graduate of Ashland University in Ohio, where I happened to have served as the commencement speaker a couple of years ago. So we like Ashland quite a lot. Professor Portteus, welcome back. Good to have you on The Hugh Hewitt Show today. KEVIN PORTTEUS: Thank you, sir. HEWITT: Talk to us a little bit about the new course. I understand, first lecture by Arnn, last lecture by Arnn-- but you're doing all the work. HEWITT: So how does Dr. Arnn manage to get away with that? I know he's your boss, but the idea that he gets to open and close, but then poor Kevin Portteus has got to do all the heavy lifting. I think there are nine lectures on Congress that you have to give. PORTTEUS: That's correct. And I should probably be careful what I say, because Doctor Arnn is a wonderful boss. HEWITT: That's just professor abuse right there-- professor abuse syndrome. Let's talk about Congress so that when Dr. Arnn does come on-- or Matt Spalding, or any of the other colleagues-- we often talk about how Article 1 has been abdicated. Article 1 is shorthand for the legislative authority-- the Congress. Let's start at the beginning. When they got together in 1787, there was already a Congress. Why did they have to replace it? PORTTEUS: Well, the Congress that existed wasn't particularly effective. It was developed on the basis that each state would have purely equal representation-- so one state, one vote. It wasn't really representative of the people, and it didn't really have effective power. So when Congress, under the Confederation, passed the bill, it was called an ordinance. And it was really only a suggestion or a recommendation to the states-- would you please do this? HEWITT: And you just mentioned-- one state, one vote. And often they had to act unanimously, did they not? PORTTEUS: That's correct. There was very little that could actually be done without the concurrence of all the states. HEWITT: And little Rhode Island used to screw around with all of us by not sending people. As I recall, I have never studied extensively the Continental Congress except in their relations with General Washington and the Continental Army. But they were not a model of efficiency. PORTTEUS: No. That's correct. And even when they did manage to pass something, the Articles of Confederation didn't have any enforcement power. So there was really nothing they could do except hope the states would comply. HEWITT: So Kevin Portteus, how did they actually get anything done from the time of the revolution through the ratification and entry into the Constitution in 1789? PORTTEUS: I think that when they did manage to get things done, it was primarily because of the sheer necessity of the Revolutionary War. And once the war ended, the defects of the Confederation-- which were already known, obviously, to people like Washington and Hamilton who had to deal with them firsthand because of the war and the army-- those really became apparent to a lot more people. HEWITT: All right, let's begin at the beginning-- the legislative power. Yesterday, I played a clip, because it's "Constitution Week,” of Justice Antonin Scalia addressing Congress, actually, in 2011 about the genius of the Constitution, saying it's not the Bill of Rights-- it's the way it was organized and the fact that the legislative power was so carefully addressed. What is it, generally, when we talk about the legislative power? PORTTEUS: So this is something that a lot of people don't really wrap their minds around very well. We talk about the fact that Congress has the legislative power, and if one goes back to the root of that word, the legislative power is the power to make laws. But then we have to ask the question-- and it is something we focus on a lot in the course-- what's the law? And we can't simply answer that by saying, well, that's something that Congress passes, because now we've gone in a very small circle. So we have to think about what it means to pass a law. What is a law? What does a law do? HEWITT: And Professor Portteus, a homeowners' association is a vile and terrible organization, but they exist in the lives of most people in America. They pass rules all the time. Are those laws? PORTTEUS: Well, to the extent that a homeowners' association is a governing body, then yes. But we have to think about what's being done in the piece of legislation. Is the law telling people what they can do, what they cannot do, or what they must to do? In other words, does it issue instructions to citizens regarding their specific rights and duties in a particular situation? HEWITT: Now, obviously, the Constitution of the United States establishes a Congress. It lays it out specifically. It's also bicameral. Justice Scalia, in his remarks, pointed out, ours is the only one of big six that has a bicameral legislature in which both the Congress of the House and the Senate are real bodies that have real authority, not merely rubber stamping stuff. That's new. PORTTEUS: Yes. And that was designed-- if one looks at The Federalist Papers, for instance-- that was designed very specifically to ensure that you've got two different kinds of deliberation. You've got a deliberation that was more tied to the will of the people in the House of Representatives, and you've got a kind of deliberation that was able, if it so chose, to take a somewhat longer view and not worry about exactly what was going to happen at the next election. HEWITT: And so did it work out, in your view? Has it been successful? PORTTEUS: Well, I think that you can't look at the way the system works today and make judgments about whether or not the Constitution was successful. Over the past 100-plus years, there's been a massive and intentional perversion of the original way of running the government and the Constitution. PORTTEUS: Well, the beginning with the Progressives, and progressing throughout the 20th century, there was, for instance, with regard to Congress, a rejection of the notion that Congress can or should legislate in the way the Founders understood that term. They thought that society had gotten too complicated and the issues were too technical. And they require a kind of knowledge that the average voter and his elected representative simply didn't possess. And so they went about the business, over the course of the 20th century, of increasingly transferring this legislative power away from the people's elected representatives and toward a variety of experts, whether it's federal judges, or cabinet officials, or regulatory commissions. HEWITT: You know what's so interesting about that, Dr. Portteus, is that the original Constitution provided for senators to be appointed by the state legislatures so that they would find individuals-- originally just men, obviously, but now it would be open to women-- who were expert in legislating. But we did away with that. PORTTEUS: Right. Part of what they were hoping for was to provide a layer of insulation in the electoral process for senators with the hope, yes, in part, that states would have some representation, and this was part of the compromise of the convention, but also that you would get a kind of what they thought of as a select body of men who would be able to, essentially, when necessary, serve as a temporary break on the will of the people when the will of the people wanted something that was either unjust or simply bad policy. HEWITT: Talking with Doctor Kevin Portteus of Hillsdale College about the brand-new online Hillsdale course on "Congress." Dr. Portteus, how much do you think the men in Philadelphia-- the framers-- had in mind themselves when they were thinking about the legislative power? That people, as educated as themselves, as thoughtful as themselves, as vociferous-- or as not vociferous-- as themselves would be the future legislature? PORTTEUS: I think that there's some truth to that. I mean, on the one hand, Madison says in Federalist 52 and 53 that we want this body to be open to the great body of the people, and so that pretty much anybody can vote for it-- pretty much anybody can serve in it. But, at the same time, they also wanted a legislature that would, in Madison's words, "refine and enlarge the public views, by passing them through the medium of a chosen body of men." So they had both expectations-- they want it to be wide open, but they also want the right person to get elected. HEWITT: And that right person, in that day, was someone who was really steeped in the classics, who had read in political theory and who was-- and we're going to come back and talk about this afterward-- devoted to deliberation. PORTTEUS: Yeah, and that idea of deliberation was hugely important. I mean, the level of education in American universities, at that time, was something that would make our undergraduates go prematurely gray. And the presumption that one knew Latin and Greek, not as a result of one's college education, but prior to entering. But this idea of deliberation was massively important. Deliberation-- that was the political art. That was the legislative art. The idea that you would think about what the good was-- figure out what the good is, figure out what justice is. But then, the real deliberative aspect of this was, how do we get it? In a particular situation, how do we get it? HEWITT: When we come back from break, we talk about that the deliberative power. I would encourage you to go to online.Hillsdale.edu-- online.Hillsdale.edu. Every one of their online courses is there, including the new course on Congress that Dr. Kevin Portteus, my guest, is the mainstay of. Stay tuned, America, to The Hugh Hewitt Show. Welcome back, America. It's Hugh Hewitt from the ReliefFactor.com studio inside of the Beltway. Thank you for listening. It's the "Hillsdale Dialogue." It's the last radio hour of the week. This week, I am talking with Dr. Kevin Portteus. He is a professor at Hillsdale College. He is the mainstay of the brand-new Hillsdale online course, "Congress-- How It Worked and Why It Doesn't." It is available now. It comes in 11 different segments. Each one of them is about 35 minutes long. Delivered in our website, it's a beautiful-- you can see a trailer for the course, if you'd like. But mostly you want to sit down and listen. 35 minutes is the perfect amount of time. I'm not sure, Professor. You have to tell me, Professor Portteus, how easy is it to take what is normally an hour to a two-hour course and get it down to 35 minutes? HEWITT: I'm looking right now at the web page for "Congress-- How It Worked and Why It Doesn't." The first lecture is by Dr. Arnn on "The Legislative Power." The second one is "Law, Reason, and Deliberation," by you. Would you talk a little bit about what deliberation actually means? Because when we usually hear it, it's about a jury deliberating. That's usually what we hear, but it's actually much broader than that. PORTTEUS: Yeah. When the Founders talked about deliberation, it was something that popped up in a number of places with regard to The Legislature, and almost always with regard to The Legislature. They meant a particular kind of thinking. So, for instance, they didn't mean maybe thinking about God or thinking about your lottery numbers, because those are the kinds of things you either can't control or that it doesn't matter what you think about it. Right? There's no way to reason your way to the correct lottery numbers. So, for them, deliberation was thinking about the things that are within their control. So that's an important part of it. That is to say, how do we achieve justice in a particular situation? And that's how you would apply deliberation to politics. And the critical, important second element of this is that deliberation had to result in choice. Right? The outcome of a deliberative process was a decision about what course of action to take. And that decision reflected the priorities and judgments of the legislators. HEWITT: And deliberation also is not well-served by artificial boundaries. And I want to talk a little bit about this, because when they arrive in Philadelphia in May of 1787, they don't know how long they're going to stay. They don't even know if they're going to produce anything. They are not bounded by a deadline. PORTTEUS: Right. And that's true. And when you sort of take that forward into the operation of Congress after the formation of the Constitution, there's no guarantee when Congress enters into a process of deliberation that the result is going to be some change in legislation or some new legislation. And that's OK, right? The fact that we didn't change legislation is not a failure. And this is something we went through with, say, President Obama and immigration where he gave us a deadline and said, if you don't pass a law, I'm simply going to act because you failed. No. Congress hasn't failed. There's simply a judgment there that there isn't enough consensus to move forward with a change and, therefore, the status quo ought to remain in force. HEWITT: They've made a choice. They have made a choice not to do something that they had been asked to do, and that is deliberative choice. Now in terms of what has happened to Congress, one of the things that did not happen in 1787 that happens every day, is television, cable news, talk radio, social media. Deliberation is not well-served by immediate attention. True or false? PORTTEUS: Yeah, I think that there's probably something to that. A 24-hour news cycle demands that somebody has something to say about everything. And, of course, one of the problems with the modern Congress-- and it may have happened in the past, if we had had this similar technology-- is that Congressmen like to move to microphones, because there's hundreds of them and they need a way to stand out. And if they don't get in front of a microphone and say something, reveal some secret or say something profound, somebody else is going to do it and steal that free media time. HEWITT: And the best legislator may indeed be the individual that you never hear. Honestly, it might be the person that you never see. They might be the most effective legislator. When I come back, I'm talking with Dr. Kevin Portteus and it's the "Hillsdale Dialogue." The brand-new course on Congress is available at online.Hillsdale.edu. You do not want to miss any of the 11 lectures-- 35 minutes each. You'll be so much smarter for it. Dr. Kevin Portteus comes back after the break. Stay tuned. Welcome back, America. It's Hugh Hewitt. The "Hillsdale Dialogue" underway. I'm in the ReliefFactor.com studio inside of the Beltway. I am joined by Dr. Kevin Portteus, Professor of Politics at Hillsdale College. He, along with Dr. Arnn, are launching the brand-new Hillsdale online course on Congress, on the legislative power, on what Article 1 is about and supposed to be about. It is in 11 different lectures of 35 minutes each. You can watch according to your own schedule. It's beautifully choreographed. It's gorgeous. I've been looking at it over at online.Hillsdale.edu. And I want to give you a brief idea of each of the segments of it. And this isn't going to be fair, because they're each 35 minutes or so. But let's go to a lecture 3, Dr. Portteus-- "Politics and Administration." What is that about? PORTTEUS: Well, the Progressives were extremely critical of the separation of powers. They saw it as, yes, it's an effective vehicle for preventing branches from accumulating power, but they never understood it as being a substantive good in itself. In other words, they only saw it as an obstacle to effective government. They never saw it as a means to facilitating effective government. And so they said, “look, we need to replace this with something that is more organic that takes more account of the realities of actual governance.” And the conclusion that they came to was that there's really only two governmental activities. One is the expression of the will of the community or the state, and the other is the execution or the implementation of that will. And they named those politics and administration. HEWITT: And so when did the Progressives seize control of this? I mean, how did they seize control of this? PORTTEUS: Well, this was-- for decades, they developed these theories. And they just gradually began passing laws, creating entities, and then transferring legislative power piecemeal from Congress to those entities. And so you can look at things like the Federal Trade Commission in the early days of the Wilson administration, for instance, transferring power over unfair business practices to an agency. HEWITT: And so when they tried to do this, didn't members of Congress rebel? PORTTEUS: Well, one of the interesting aspects of this era was the extent to which progressives in both parties-- and this is something we forget, there wasn't one-- there was a Progressive Party, but looking at the other two parties, they both had progressive and conservative elements. And in the early part of the 20th century, the progressive wings in both parties were rising in ascendance. So, yes, there were conservatives and there were critics, but think about something like the election of 1812 where you essentially have a four-way race involving three progressives and a socialist-- a literal Socialist Party-- and he did better that year than he ever did before or since. HEWITT: So that was the way. Prior to that time, there were two distinct periods in history. And I want to go backwards. There is from the framing up until the 1850s and the collapse of dialogue-- the collapse of deliberation that leads to the Civil War. Then there is post-Civil War through to the Progressive Era. Let's talk about the first era, Kevin. What was it that characterized all issues outside of slavery? PORTTEUS: Well, the Federalists and the Republicans-- and later, the Whigs and the Democrats-- they divided primarily over economic issues. So things like the tariff, and the Bank of the United States, and what we would today call infrastructure, but they called “internal improvements.” Those were the issues that defined the period post-Constitution. But prior to slavery becoming the dominant issue. HEWITT: But then slavery arrived-- and re-reading McPherson's Battlecry of Freedom-- Congress broke down. Because it broke down over the Fugitive Slave Act, it broke down over the Missouri Compromise. It broke down because of the Dred Scott decision. It just broke down. And with it, the country. Once it was reassembled-- and there was just a Republican Congress during the war and then Reconstruction-- did it resume its old ways or it had it become jaggedly political? PORTTEUS: Well, you had, for a long time, after the Civil War, a period of essentially one-party government. So you had-- there were Democrats, and there were increasing numbers of Democrats in the post-Civil War period. And they, essentially-- Democrats in the post-Civil War period-- conducted a running battle with Republicans in the White House and in Congress to nullify the results of the Civil War. And so it was contentious in that sense, and they were aided by a sympathetic Supreme Court. But it really was a period of one-party dominance in the post-war period and a period of patronage and what came to be considered the worst excesses of the spoils system during the latter part of the 19th century. HEWITT: And when the 1876 stalemate occurs, there's a deal struck. The Republicans get the Presidency. Federal troops are withdrawn from the south. And then we have the Solid South become Democrat, and politics return through the panics, et cetera. But, eventually, the Progressives arise before World War I-- and you just talked about them. And they are in the grip of the pseudo Enlightenment, I will call it, where they believe science will solve everything and that legislators are not to be preferred, but experts should be the preferred. And they went along with it, Kevin Portteus. They just went along with it. PORTTEUS: Yeah. There was a sense that we had reached a point where the large political questions had been resolved. And what was left was technical implementation. But, again, because society-- a modern industrial society, in their view-- was so complex, the old ways of doing business-- which Woodrow Wilson likened to government as a traffic cop, which wags its finger at everybody and says, “now don't anybody hurt anybody else”-- that was simply obsolete. It was inadequate to the needs of a modern state of industrialized society with massive corporations and concentrations of wealth, and so on. HEWITT: Now standing in the way of that was something that I teach my Con Law students about that's a dead letter right now, but it may be resurrected, called the Nondelegation Doctrine. What is that, Dr. Portteus, and why is it in abeyance right now? PORTTEUS: Right. So the Nondelegation Doctrine is the idea of going even back before the American founding into philosophers like John Locke, for instance, that says that a legislature cannot transfer to any other entity the legislative power which was granted to it by the people themselves in the formation of the government. And that was something that-- there were cases involving it, it came up. But during the Progressive Era, it was seized on. And progressives saw this as undermining the Nondelegation Doctrine as critical to establishing the kind of administrative system they wanted to establish. HEWITT: And when that came about, they got it done. They got it done over the objection of conservatives, but the court had to acquiesce. When did the court acquiesce in the delegation of the legislative authority? PORTTEUS: Right. And so this is one of those doctrines. When we think about the Supreme Court today, we think about free speech, we think about abortion, we think about campaign finance. The nondelegation cases are a really obscure series of cases. And throughout the Progressive Era, in a couple of different instances, the court had been moving in this direction. But I think the real sort of turning point was in 1928 when the court ruled on an obscure case called JW Hampton, Jr. & Company v. United States. And, in that case, the court, led by William Howard Taft-- a supposed conservative-- said that as long as Congress establishes an intelligible principle to guide agency action, then there's effectively nothing constitutionally suspect about a Congress abdicating its legislative authority. HEWITT: And the intelligible principle dicta, that is meaningless now. It has been drained of any-- you and I might say, give me an intelligible principle, and you and I will debate forever whether or not one has been put forward. But in the eyes of the court, if the Congress burps, they find an intelligent principle there, do they not? PORTTEUS: Yeah, there's essentially-- the principle is so broad now that there's effectively nothing that isn't going to pass the test. So, for instance, the FCC has given power to issue broadcast licenses as quote, "the public interest, convenience, or necessity," unquote may require. Well, what does that mean? Well, that's left up to the agency. And then the court has essentially said, well, as long as they make a plausible case, then we'll go along with it. HEWITT: So now when that took place and the Court began to abdicate or at least acquiesce in the abdication, there also came to be known as deference. So you could delegate, and not only was that bad, then deference aligned with delegation. What's the result of that lethal combination, Kevin? PORTTEUS: What that effectively means is that each administrative agency under this doctrine of deference is basically the sole determiner of its own powers. It gets to decide-- it looks at the statute enacted by Congress that empowers the agency and says, OK, we think this means X. And as long as the statute doesn't clearly state otherwise-- and, of course, that's very much in the eyes of the particular judge or justice-- then the courts are obligated under the Doctrine of Deference to sign off on that interpretation. HEWITT: So it's a cascading-- first, you get rid of the power, then you give the power away to an agency, then the agency gets deferred to by the court. And, therefore, unelected people are running our lives. Let's talk about the era of so-called congressional reform in the 1970s. What happened? Did it work? PORTTEUS: Congressional reform was actually-- in the 1970s, was the culmination of a process that had been going on for decades. Progressives had a vision of what a legislature should look like. And, to them, in terms of the activity of the Legislature, the model was something like the House of Commons, where you had, in their minds, stimulating and edifying debate over broad issues. And members had to be parliamentarians, but they were also sort of zealous representatives of the interests of their constituents. And they hated the stifling committee structure, and so on, that dominated Congress leading up to the Progressive Era. And so over the course of decades, really from about 1910 until the 1970s, they went about the process of decentralizing power-- moving power away from, first, the Speaker of the House and then the committee chairman-- until you've got a body where power was broadly diffused and particularly-- and this was important to them-- spread among the younger, newer, and the more liberal members of the Democratic Party Caucus. And so they saw decentralization as important to making Congress and the Democratic leadership more liberal. HEWITT: And that happens when? And so a Republican-- President Ford is going to veto this bill, and we have 289 seats out of 435 in the House of Representatives. And we can't figure out how to get one more and override the veto. We can't get over this hurdle, because we can't mobilize our own members. HEWITT: Unbelievable. When we come back, our final segment about the brand-new Hillsdale online course on the "Congress-- How It Worked and Why It Doesn't," with Kevin Portteus of Hillsdale. Welcome back, America. It's Hugh Hewitt from the ReliefFactor.com studio inside the beltway. The last segment of the last radio hour of the "Hillsdale Dialogue" is underway. All things Hillsdale-- all of-- it collected at Hillsdale.edu. You can sign up for Imprimis, the free speech digest. It will come to you, as it does to millions of people, every month. You can also watch every online course, including the very brand-new course on "Congress-- How It worked and Why It Doesn't." 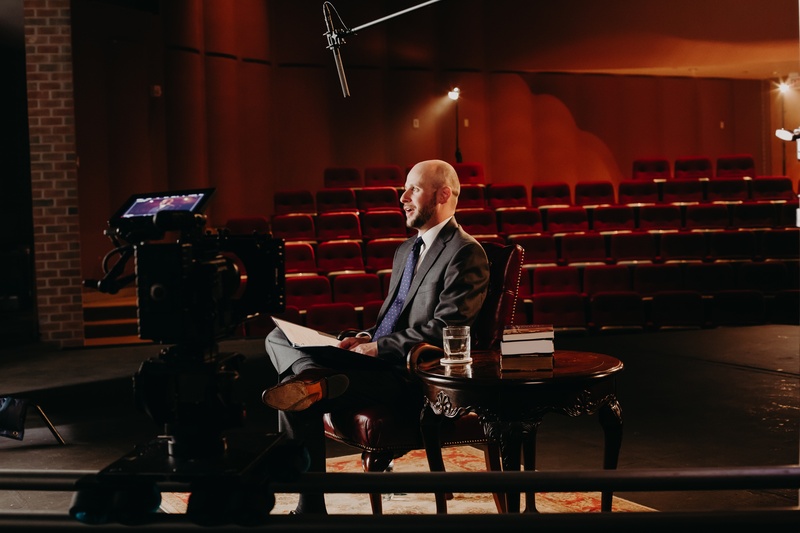 The online.Hillsdale.edu-- the brand-new course-- and it's going to have millions of people watch it because it's so fascinating-- is led by Dr. Larry Arnn and Kevin Portteus. Kevin Portteus is my guest right now. The last couple of lectures that you give, Dr. Portteus, are on the modern Congress. And this must be dreary business, because they have not distinguished themselves, with the exception of one great burst of legislative activity after 9/11. In fact, they've often abdicated to the Executive here. What do you think of the modern Congress? PORTTEUS: Well, we talked about delegation in the earlier segments. And I really think that delegation for Congress has become, today, a kind of disease, which is to say it's reached the point where because Congress is able to abdicate authority, it really is unwilling to exercise authority. It's become so used to being able to fob off responsibility onto somebody else that when something comes up where they really ought to be doing something-- and people actually still expect them to do something-- that they really have no idea how to do it. It's reached the point where, in recent years, Congress is unwilling or unable even to pass a real budget. And this was the one thing that they kept during the creation of the administrative state that allowed them to exercise some control. They could always look at bureaucrats and say, we have the money and you want the money. And I think that that's even begun to fade. And if you want to see that visually represented, just look at the look on Peter Strzok's face when he testified before Congress-- just seething with contempt for elected representatives. And that wasn't an attitude that bureaucrats took, even 20 years ago. HEWITT: There was contempt on the former FBI Head of Counterintelligence face. There's often contempt for Congress. Let me talk to you about how to get rid of that contempt. There also is a filibuster in the Senate, which is nothing like the filibuster that the Framers had in mind. I don't believe that for a second. Does the filibuster need to go, in your opinion, Dr. Portteus? PORTTEUS: Yeah, when you say the filibuster is nothing like what the Founders had in mind, I think that's correct. They never had in mind the idea that, even in the Senate, even where you were supposed to have more deliberation, the idea is that simply by assertion, a minority could obstruct a business. They didn't believe that was possible. Now they wanted a talking body, and they wanted debate. But they also, once debate had come to an end, they expected that action would be taken in some way. In other words, if a majority existed to pass the bill, they would pass the bill. And if it didn't, they wouldn't. HEWITT: They wanted a talking body. What is a talking body? PORTTEUS: The point of the Senate-- and for a long time-- prior to the institution of cloture in 1917-- the mechanism for ending debate-- debate in the Senate simply went on as long as people wanted to talk about the bill. And this was something you could do effectively in an age where the bills were short. And the bills were remarkably short in this period compared to legislation today. If you look at things like the early naturalization laws, which I've looked at, the first two naturalization laws in 1790 in 1795 were two pages. PORTTEUS: The Kansas-Nebraska Act, which was this massive piece of legislation by the standards of the time, was about 30 or 32 pages, as opposed to the massive 1,000- or 2,000-page bills that are written by armies of staff, and so on. You could do this when there wasn't a lot for Congress to do and the bills were fairly short. HEWITT: Now I have to mention one pernicious development-- staff. I have had this argument again and again. Once we professionalize staff-- and I have many friends in the congressional staff-- they developed an attitude toward citizens, which is of contempt that they do not have the expertise necessary to draft legislation. That was never the intention of the framers. And I'm not sure that we don't need term limits on staff-- not members, but staff. PORTTEUS: Yeah, well, at least at the lower levels, it's worth noting that-- and I have a lot of students that go on to work as legislative staffers-- the turnover on its own, in many cases, is enormous. And so you do have a small cadre of people who are career staffers, but you also have a large number of kids that start out and don't stick with it. But to your larger point, for most of the 19th century, a member's office was his desk in the congressional chamber. That was it. There was no Dirksen Building. There was no Hart Building. There was no Cannon Building. These are all creations of more recent times. And so a legislator actually drafted legislation, or his party did it and he introduced it. And I think that's part of why legislation is so long and incomprehensible. I think another part of it, though-- and maybe the larger part and the reason why you need staff to draft legislation-- is that you need a lot of verbiage to make laws that confer special privileges and special benefits. HEWITT: Amen. It is a terrific brand-new course. Go and watch "Congress-- How It Worked and Why It Doesn't" at online.Hillsdale.edu. Dr. Kevin Portteus, thank you.